This year, our "big summer vacation" incorporated both our families, the Dublin Irish Festival, GenCon, and both Liz & my high school reunions (we went to different schools - in different states - but our reunions were about three weeks apart). The Dublin Irish Festival was interesting. Liz & I had gone a few years ago, back when we were just dating, and it's grown a lot since then. I gather that Liz and her family had gone more reliably back then, but as it's grown, it's become more daunting and less rewarding. I guess it's one of those things where growth & success detract more from the experience than they add. The school has changed a lot - it's now even more convoluted and twisted than before. No wonder I had nightmares about getting lost between classes! It was strange how much some people had changed, and how little other people had. I'm still awed by those of my classmates who already have children, and impressed with the range of "life paths" we've taken. 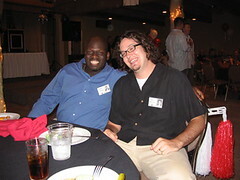 It was great to see so many old familiar faces in one room, but I can't help but wish more old friends had been there. In my case, many of my closest friends were older or younger than I was, or moved away before graduation, or were foreign exchange students... It's nice to see people I graduated with, but I wish there were some way to see all the people I knew. GenCon was (again) a blast! It's one of those amazing things, where, when it's over, I'm sad and don't want to leave, and can hardly believe I (potentially) get to do this every year. 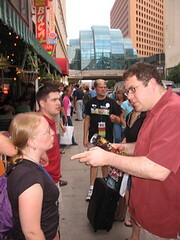 For those reading this who aren't aware, GenCon is a gaming convention, held every year in Indianapolis. 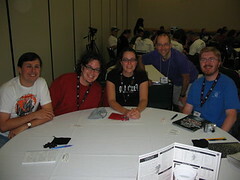 GenCon and Origins (held in Columbus, Ohio) are the two "major" gaming conventions, and I went to Origins each of the years I was at Ohio State. However, while both are "major" in size and stature, GenCon has a dramatically different feel - less competitive, more relaxed and, I think, that much more "fun". I should say, last year was our first GenCon and after that first trip, we knew we were hooked. 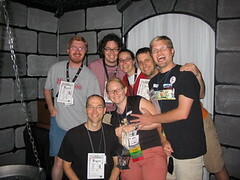 GenCon is one solid quanta more enjoyable than Origins, because of the "Con-within-a-Con" formed by our "extended gaming family" - current & former game-buddies of ours, who connect up with current & former game-buddies of theirs, who connect up with... you get the idea. The whole thing snow-balls into a 30-some member "extended family reunion". This year, we introduced two new members: Bo Brinkman, a good friend of mine since high school, and Aaron Steffen, an illustrious GM from Madison and WoW-guild-mate. MLwM is a serious, somewhat dark game: the group starts by defining the Master (a Dr. Frankenstein-ish sort of terrorizor of townspeople) and what, specifically, he wants from the town. 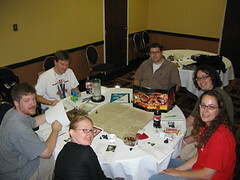 The players then play the roles of the Master's various monster-like minions. In this game, our Master wanted to collect the eyes of the recently deceased, so that she could visualize the after-life (or something like that). My character was the town doctor who reported to the Master on patients near death, and had a tendency to "help things along"; Liz played "the harvester", responsible for carefully extracting the eyes (as fresh as possible, of course). The idea of the game, is that you make "overtures" to the townspeople, gradually building a base of human kindness, from which you may eventually over-throw the Master. In this case, I made, and gradually increased, connections with a local woman who'd just "lost" her father, my nurse, and a local crippled boy, which lead to "the Endgame" - although, it was actually Liz's character that prevailed against the Master in the end. The game itself played very well, and I enjoyed all the characters and their interactions, but it felt somewhat over-plotted. 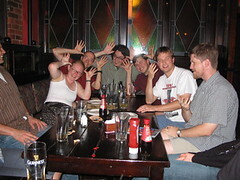 Still, it was a lot of fun, especially as it served as a mini-reunion for most of our old Madison gaming group. They Meet in a Duel! Liz and I have been hosting a twice-monthly game of Burning Wheel back home, and I wanted to try the new sci-fi version of the game, based on Christopher Moeller's "Iron Empires" comic series. I like Burning Wheel plenty well in theory, but the actual play experience has not been holding up to expectations. At any rate, in this game, we were playing guerilla/insurgent aliens defending our little mining planet from larger galactic forces. Last year, after seeing TrueTavern, our biggest "we have to do this next year" was TrueDungeon. The "TrueAdventures" line of games are essentially "live-action dungeons", where you solve problems more physically than in standard D&D. Whereas LARPs tend to be more character focused, from what I hear, the True games tend to be more focused on physical challenges. I had fun going through the dungeon, mostly thanks to our fantastic group, but there were definitely some frustrating parts. It wasn't always clear how "physical" our solutions were supposed to be: for example, in the first room, where we were supposed to retrieve our stolen belongings (a bag) from the other side of a row of metal bars, Jay (in-character) tried to bend the bars of our cage, and lo-and-behold! they separated. The "room monitor" shut that down quickly, apparently we were supposed to assemble a "grappling hook" from some miscellaneous props on the other side of the room. Still. I liked solving the puzzles in a physical way - weighing out eggs to find the "magical" fire-door opening egg, moving "crystals" around to activate a door, etc. - but it wasn't worth the overall cost of the event. TrueDungeon was $28.50 this year, and - more importantly to me - took a little over two hours to run through. With only three-and-a-half days of gaming available at GenCon, that's actually a lot of time - there's always something fun to do here. Dice! Lots and lots of dice. Liz and I both decided we needed more dice. Like last year, this year's penultimate event (second-to-last, but certainly not second-to-least) was a d20 game GM'd by the illustrious Tom Azar. This year's game was a "reverse dungeon" - we played monster characters (a kobold, a manticore, an ettin, etc.) 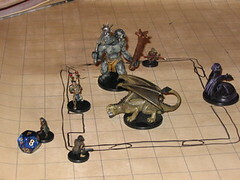 fighting a "heroic" party invading our dungeon lair, then being sent out by our master to harass the local villagers. Tom has an astounding level of creative energy, and puts an amazing amount of detail and characterization into play, while remaining extremely flexible and player-oriented. Continuing last year's tradition (though it is an apparently ancient custom in our tribe), we got the whole "extended gamer family" together on Saturday night for carousing and a late night game of Time's Up. Just like last year, I laughed so hard I cried. 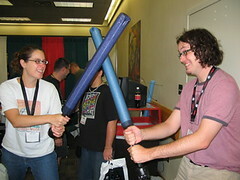 I really, really wanted to go to GenCon this year. Back when the "who wants to room with whom" emails started (January-ish? 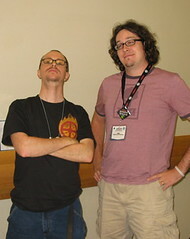 ), I made a list of things I wanted to find, demo, or otherwise experience at GenCon this year. Near the top of that list was Everway. I'd heard about Everway, back when it came out, but didn't actually purchase it at the time. Did one of those "Hunh. That's neat." and kept on walking. Last year, sometime after GenCon, as I got more and more involved with the indie RPG "scene", this game floated back to my mind - specifically, that it's exactly the kind of thing to look for at GenCon. So, late Friday night, I decided it was time to try eBay. Lo and behold, with an investment of mere seconds, I found one - brand new, still in shrink-wrap, and quite cheap. And - get this - it ships from Indianapolis. In the end, I figure I still bought Everway at GenCon.